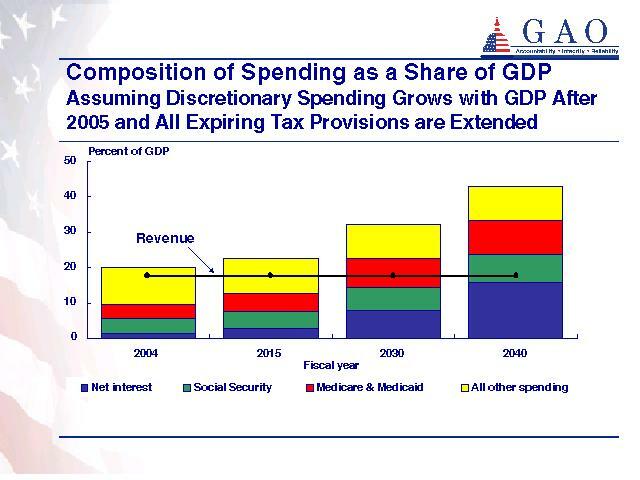 That expanding blue portion is debt service, and this graph shows it taking up almost all government revenues by 2040. Put another way, this graph shows somewhere around 16% of our entire Gross Domestic Product going to service our national debt. However, things are worse than this graph lets on. It assumes that all of Bush's tax cuts are made permanent, and that no other changes are made to the tax system. This means that it is not assuming a fix to the Alternative Minimum Tax, which most people think will happen, and which will reduce revenues. It also assumes that discretionary spending grows only as much as GDP, which most people think is unrealistic. In addition, if you check out the modeling assumptions, the GAO has assumed that interest rates remain unchanged. As they note, this is unlikely, especially if we rack up debt at this alarming rate. They also assume that productivity growth remains unchanged, which is also unlikely if we keep running massive deficits. 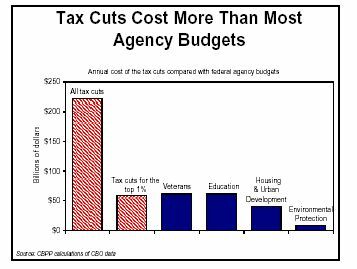 As you can see, we could eliminate the entire Department of Housing and Urban Development and the EPA, and still not save enough money to make up for Bush's tax cuts to the top 1% alone. We are mortgaging our nation's future, and leaving ourselves vulnerable to really serious problems. We should stop. My party worked hard to bring the deficit down, and we put a lot of our goals on hold to do so. Now that the Republicans are in charge, they should do the same. They claim to be patriotic, but I do not see how one shows a love of one's country by bankrupting it. Um, yeah, deficits are bad, the current administration has horrible financial policies, and the GOP has abandoned its longstanding practice of cynically pretending to even care about small government or fiscal responsibility. I'd still like to see a Memorial Day post, though. They mean to kill Social Security and Medicare, at least as middle-class entitlements. As you have seen this year it will not be easy, but they are serious and committed to doing it. The only way appears to be to crash the economy and bankrupt the nation, but they are willing to pay that cost. They are preparing by providing the upper class with a safety net via a range of tax cuts. More Keynesian tax cuts would have provided a level of security for the lower three quintiles that would have been counterproductive. The working class must be desperate enough to vote against tax increases. It is a plan to create a permanent hereditary aristocracy. It includes factors to decrease innovation and mobility, a low growth low risk society. I will provide some cites tomorrow maybe. Two things I read today. 50 people have remained in the Forbes 500 from 1982-2004. The rest have not become poor, but have lost relative status due to the rise of new entrepenurial fortunes. Gates & Ellison are knocking at the doors, wanting in. This is not good. In order to retain political and social power, wealth needs be derived from rents, not venture capital. This too, is part of the plan. Someone will own those bonds in 2040. Those who own the bonds will demand a low inflation, low growth socially stable society. Spain experienced no significant sustained economic growth from 1600 to the present day. The families who made fortunes in Latin America locked their dynasties into power. It can be very hard to overcome such oligarchies. Bush at Yale was disturbed by very bright young people without the proper backgrounds. It wasn't right that there should be such competition. His Saudi friends faced no such problems. I am sure he has been planning the corrective ever since. Conservatism is not, and shares little with, libertarianism. The memorial day post...it's not just a good idea, it's *mandatory*. why not just cut spending? "My party worked hard to bring the deficit down, and we put a lot of our goals on hold to do so. Now that the Republicans are in charge, they should do the same." Having a high deficit _is_ a mid-range Republican goal, of at least the Grover Norquist wing of the party. The possiblity of a future like this is exactly what they need in order to make their vision acceptable to the public. It is only when graphs like this one become part of the routine political dialogue that they will then present the public with what they view as a Hobson's choice -- the unparalleled evil of raising taxes or losing every other governmental program. Hopefully, the remainder of the public will not buy this, but given the reluctance of any Republicans I've ever met to criticize Norquist, I'm not counting on a favorable answer when the rubber hits the road. Hey, at least they're polite and civil about bankrupting us. "why not just cut spending"? Agreed. Bring the troops home tomorrow. The Democratic Party should hasten the government's bankruptcy by fomenting a ferocious and dangerous tax revolt at all levels of government. Either the tax cuts are repealed and our spending priorities observed or we stop paying taxes altogether. I have everything to lose by this strategy, including the death of at least one family member, but making a corpse of government before the Republican's do will be worth it. We'll let them cremate the corpse. Don't steal my money for the military either or you'll need the military to keep enforcing the theft. About memorial day posts: like most people, I imagine, I thought about those who died yesterday, in my own way. But nothing I thought seemed worth posting, because it was just what I imagine people were thinking anyways. As far as I'm concerned, don't take the lack of posts as indicating a lack of concern; just a lack of anything particularly interesting to say about it. Republicans are not conservatives. There used to be conservatives in the Republican Party, but none of them are speaking up. They have sold out to the kleptocrats and are tolerating the theocrats, hoping to continue using them -- neither of which fit into the American tradition of conservative politics. One thing that the Republicans have forgotten is that inequality is easier to swallow if there is fairness of opportunity. They are taking that away and eventually they will suffer for it. Let's hope that happens before they destroy this country. after listening to the professional Republicans like Limbaugh, Coulter, Hannity, et al, one might be forgiven for thinking that Republicans are simply anti-Democrats. combine that with the fact that the Democrats they're opposed to are mostly strawmen, and it's pretty easy to see how anything is justified. That's quite simple. Americans have no interest in that. They have made abundantly clear they don't want any major spending cuts. Any one who has tried to pass such legislation has been quickly defeated. If I allow myself to think about it, I become so angry with the people who voted for Bush that I can't finish tis sentence without violating the posting rules. Not being any sort of Norquist fan, I have a hard time even imagining what his position on any given issue is. I find him more irrelevant than objectionable. I've heard him opinionate once or twice, and what I managed to hear before turning the channel was eminently dismissable. So much so that I wiped the memory cells that would have remembered what he was saying and put movie trivia in its place. "I find him more irrelevant than objectionable." That may make you unique. For an outline of his level of influence, see link. Who DO you like? That way, when we argue I can pretend you're them instead of Delay or Norquist. Speaking of Memorial Day, some people take an oath to defend this country against all enemies, foreign and domestic. The deficit is a major problem for the country, and it is also one which gets much less attention than it deserves. I suspect this has to do with the media's perception that these sorts of "numbers" stories are boring and complicated, or, more likely, the media's own lack of understanding. The economist Herbert Stein enunciated a famous rule: "If something cannot go on forever it will stop." Our current level of borrowing cannot go on forever, hence it will stop. Whether it does so because we, as a country, have the discipline to put our finances in order, or whether it does so because of the actions of lenders and financial markets, will make a huge difference as to what happens when it does stop. I agree totally that the Bush cuts need to repealed, but we also need to start calling to account the free-lunch (sorry freelunch, I don't mean you) politicians who refuse to recognize the problem. I didn't vote for either of them, to the best of my recollection. Would you agree or disagree with that characterization, Slart, laying aside your personal uninterest in him? I guess you'd have to show me something besides your opinion and a Wiki page. Of course you could make the argument that people are influential to the degree that others think they are, but the cure for that one is a bit obvious. Slart: he is very influential with the party. See here, for instance. "I guess you'd have to show me something besides your opinion and a Wiki page." "The "Wednesday Meeting" of Norquist's Leave Us Alone Coalition has become an important hub of conservative political organizing. President Bush began sending a representative to the Wednesday Meeting even before he formally announced his candidacy for president. "Now a White House aide attends each week," reported USA Today in June 2001. "Vice President Cheney sends his own representative. So do GOP congressional leaders, right-leaning think tanks, conservative advocacy groups and some like-minded K Street lobbyists. The meeting has been valuable to the White House because it is the political equivalent of one-stop shopping. By making a single pitch, the administration can generate pressure on members of Congress, calls to radio talk shows and political buzz from dozens of grassroots organizations. It also enables the White House to hear conservatives vent in private -- and to respond -- before complaints fester. " (http://www.usatoday.com/news/washington/2001-06-01-grover.htm)"
Norquist also writes a monthly politics column for the American Enterprise Institute Magazine"
(both from the article I cited) are insufficient, please set forth a set of criteria for what you believe would be sufficient to constitute Norquist being viewed as "influential" in your eyes. I guess you'd have to show me something besides your opinion and a Wiki page. I have no idea, Anarch. Is there a way to determine whether someone's got power, other than what the papers have to say? "No". Or maybe, if pressed, "Yes". Slarti: is there something wrong with what the papers say, when they don't just say "he's influential" but cite facts like: his holding weekly meetings at which Republicans plan strategy, meetings to which the President sends an envoy; that he worked with Tom DeLay and Abramoff on the extremely important K Street project, and so forth? Not to mention, of course, the fact that he runs a rather large and influential Republican organization. Slart: "No". Or maybe, if pressed, "Yes". Hm. Do politics and governance actually interest you Slart? No, not saying that. Just that I haven't read much about him. But, stipulating that he has influence, I'll revise my initial comments to include that he's a Palpatine in the making, but that I still find his views eminently dismissable. Maybe if the guy was an obscure professor at a midwestern university, Slarti would be more impressed by his power and influence. Unless you actually run in those circles, sooner or later you're going to have to trust someone else's assessment of the situation. [Coupled, of course, with evidence for that assessment, as the NYT, USA Today, etc. have all done.] If you have a better source than all those that have been cited upthread (or at least a counterweight to their allegations) I'm all ears; as it is, it seems like you're evincing skepticism for the sake of evincing skepticism. ...I still find his views eminently dismissable. Dismissable on a personal level, i.e. that you give them no personal credence? Or dismissable on the national level, i.e. he has no power in this country to effect those views? "No, not saying that. Just that I haven't read much about him." Slart, I hope you'll forgive me for observing that these sort of answers seem to be a clear and regular pattern with you. You regularly assert lack of knowledge of Republican figures and politics, and regularly respond that you didn't vote for X, don't know much of anything about X, and ask for evidence that X is remotely relevant to the Republican Party. Respectfully, and without wishing to ask something hurtful in any way, if you don't in fact know very much about the Republican Party, pay little attention to it, can't identify major figures in it, and commonly profess ignorance about it, why are you a poster on a primarily political blog? This isn't Wiki. Any of us could go into Wiki and edit it any way we liked. It would eventually be reverted to what was generally accepted to meet Wiki's NPOV. I'll be the first to admit this is not favorable to Norquist. I flip the channel on those rare occasions when he does speak in public on CSPAN. Perhaps there is a good reason the right tries to minimize his exposure to the public at large. I had forgotten that Norquist was one of the authors of the Contract With America, which probably ought to settle the question whether he's influential right there. I had also forgotten that he used to lobby for the unbelievably hateful RENAMO movement in Mozambique. Slartibartfast's dodge here is captured nicely in a Tom Tomorrow cartoon that I don't have time to look up right now. I'll find it by end of the evening if no one beats me to it. So, S., you've heard of George W. Bush, and I presume you did vote for him. He wants to make those big tax cuts permanent. Hilzoy, backed by the GAO and other analyses, is concerned for the fiscal future of the country if that happens. You voted for someone who ran on making those tax cuts permanent, but maybe you don't support that but voted for him for another reason. Do you support making the tax cuts for the top 1% permanent? And if you do, what's your plan to keep the economy and country in one piece? Or, what's your theory about why it won't hurt a bit? Couldn't resist, and the archive was easier to find than I thought. As hilzoy pointed out, you did ask. If you'd wanted a thoughtful, incisive analysis of Super Grover, I'd probably have pled insufficient time. "If you'd wanted a thoughtful, incisive analysis of Super Grover, I'd probably have pled insufficient time." A simple sentence or two of opinion about one of most well-known most influential Republican movers-and-shakers would do fine. Implicit denial of the notion that Nordquist is any such thing isn't quite so fine. "I've never heard of him/I've not read much about her/I don't know about that" regarding anything negative about the Republican Party: not so enlightening. "As hilzoy pointed out, you did ask." About Nordquist? Not until after you'd stated that "I find him more irrelevant than objectionable." Do you still stand by that opinion, by the bye? Slartibartfast: Too quick with the snark, fella. I posted the link. Study those first two panels and see if there isn't a little glimmer of self-recognition. Dan Perkins has your number. A simple sentence or two of opinion about one of most well-known most influential Republican movers-and-shakers would do fine. This makes me immediately ask: well, why wasn't it? Slartibartfast: Too quick with the snark, fella. Snark can never be too fast. Study those first two panels and see if there isn't a little glimmer of self-recognition. Yes, that does look familiar. Didn't he use those in another half-dozen versions of Tom Tomorrow? So slarti's unfamiliar with Grover Norquist. Is this important? Does anyone think he's lying? I haven't noticed slarti being unwilling to express his views, so presumably if he were familiar with Norquist he would tell us what he thought of his activities and opinions. Or maybe he wouldn't, if he didn't feel like it. In any case, I fail to see what slarti has done that opens him up to the kind of interrogation he's being subjected to. It's not as if he wrote a post claiming that Norquist was a great and wise man. Respectfully? This doesn't sound very respectful to me. Someone complains that no one on the right is ever critical of Super Grover. I am critical of Super Grover. I am then critiqued on my criticism of Super Grover. I think next time I won't bother, unless I've got the sort of time at my disposal that Mr. Farber has. I take Slart's Thoreau-like musings here on, say, putting up wainscoting in the dining room, to be a breath of fresh air. I think he pays attention to what is really important stuff closer to home, like his family and local Florida politics. His Zen-like demeanor while I rave and foam at the mouth about Grover Norquist is maddening but instructional. When Norquist becomes more Slartibartfastian and pays his taxes without too much revolutionary talk, I'll know the crisis has passed and I'll shut up. Because in your response to the question at 02:39 PM, you only said that you couldn't "even imagin[e] what his position on any given issue is" and that you had no memory of his opinions; when asked if you agreed or disagreed with a characterization of him, you replied at 12:49 that, essentially, you couldn't answer. "I guess you'd have to show me something besides your opinion and a Wiki page." This is not actually giving an opinion, as I understand what an "opinion" is. It isn't, in my understanding, stating that you can't give an opinion because you lack knowledge and can't remember. Bernard: "Respectfully? This doesn't sound very respectful to me." What would you suggest as a more respectful phrasing? Very well, Gary, you should take it that I only imagine that I have an opinion. Although, I will add that the time Gary Farber has on his hands benefits all of us. Time on one's hands, even to express disdain, is the friend of political blogging. Although I'm not sure how political blogging and the Internet in general have exactly added to American productivity, given that all of us seem to take much time away from our more productive pursuits to waste the time on our hands. But I was always the kid in school who was reading Flaubert during math class and studying baseball stats in English class. Nothing got done except the important stuff, according to my idea of productivity. Slart: "I am critical of Super Grover." You were? Where? What was your criticism, on what issue? "I have a hard time even imagining what his position on any given issue is." You criticized him without knowing his position on any given issue? Over which issue? Slarti, I'm sorry if my discussing this offends you, I truly am; but I don't think there's anything illegitimate in my asking you questions because I can't make sense of what you're saying, or if I ask you about your style of not answering. Please, though, be clear that I wasn't in any way trying to suggest that you shouldn't be posting here, or to denigrate your positions. I just have great trouble figuring out what are your positions, given your oracular, cryptic, style. Perhaps I'm the only one who feels that way, of course, and it's just me, not you at all. "Very well, Gary, you should take it that I only imagine that I have an opinion." Alternatively, you could actually state your opinion. This is an example of what I'm referring to. I realize that outright stating of an opinion does put one in danger of discussing it. I would suggest that the question itself is disrespectful. I think that when slarti posts something you disagree with you are free to question him about it, challenge his premises, and generally point out to him the error of his ways. I'm as likely to do that as you are. But I think that trying to draw him in on the basis of "You voted for Bush so you're obviously a pal of Norquist and a fan of national bankruptcy," is silly, at best. "But I think that trying to draw him in on the basis of 'You voted for Bush so you're obviously a pal of Norquist and a fan of national bankruptcy,' is silly, at best." Now, wait a minute, I never said anything remotely like that. Which is to say, I don't contend that there aren't very possibly more respectful ways of asking what I did ask -- that's why I asked for suggestions. But I'm afraid I think the above is a vast distortion (made in good faith) of what I said. You will find enough hits. I have seen it put in a few different ways, some without the term "baby", but there is no dispute that this is his stated intent. So, in this respect at least, while some of us are concerned about the deficit, this is one case where the Bush administration is dangerously close to a legitimate mission accomplished. I think my question's legitimate, and I'd like an answer. Let's leave Grover Norquist the hell out of it, and stay on the topic of the post. Do you support making the tax cuts for the top 1% permanent? And if you do, what's your plan to keep the economy and country in one piece? This is a little baffling. Are you suggesting that perhaps I am, like Super Grover, engineering policy behind the scenes? What's your plan for taxing the top 1%? Should they be paying what they're paying now, what they were paying when Clinton left the White House, or even more? And why? Let's ask the question in a different way: Slarti, do the implications of the graphs and figures in the original post concern you at all, and do they imply a gathering, immensely negative effect, or not? If so, what policies would you prefer your political party adopt in order to avoid that negative effect; and how does the party's current economic planning and policy differ from what you would prefer? How do you plan to help them achieve your preference? If you don't think there is anything negative implied by the graphs and figures in the original post, then can you explain how hilzoy is interpreting them incorrectly? Could be. I admit that Gary did not make the statements I describe. My apologies. But that doesn't affect my attitude towards Gary's question. The problem I have with it is that it's not a question at all, except in form. The message it sends is, "You shouldn't be posting here because you don't know enough about the Republican Party to make a reasonable contribution." That is not a respectful statement. As for your statement and questions, I think they are legitimate in that they can reasonably be addressed to Bush supporters. But I don't see why anyone is automatically obligated to answer them. Sure, someone who defended these ideas, and continues to defend them, in a public forum has an obligation to address these questions. But otherwise I see no basis for picking out a Bush supporter at random and grilling him on the matter. I voted for Kerry, but I'm sure he advocated some things I didn't think made sense, as do other Democrats. I don't consider myself obligated to defend all the policies Kerry advocated. Bernard, I gave Slart the chance to say whether the tax cuts are something he supports. He does. And I do think it's a relevant question of Gary's: Slarti is professing ignorance about one of the most powerful people in the modern Republican Party. Slart's supposedly a main poster here. I'm not picking him at random. He commented first -- and instead of engaging Hilzoy's post, waved his hands about another commenter's mention of Grover Norquist. I'd like him to answer Phil's question. I'd like to hear a defense of the Bush fiscal policy. What is ObWi supposed to be for, if not left-right discussion of the issues? The fiscal crisis, whose severity is created almost entirely by Bush's tax cuts and his war, both of which Slarti supports, is one of the biggest issues there is. To answer Slarti's question: I support the repeal of the Bush tax cuts for everyone making $200,000 a year or more, the reinstatement of the estate tax, and I'd support a significant increase in the capital gains tax.The tax burden has been shifted from the richest to the middle class over the last 20 years to the point that we virtually hava a flat tax system. Unless there are significant shifts back, and/or huge cuts to the military share of the budget, it will be impossible to fund any discretionary item in the non-Pentagon budget soon. That's what Hilzoy's chart shows. I would like to prevent that situation. Slarti seems cool with it. Grover Norquist is too, and although Slarti claims not to know anything about Norquist, or to agree with what he does know, they're on the same team if they can look calmly at a future in which there is no government spending but Medicare, Social Security, and the military. Well, no Social Security either, if they had their way. Nell: worse than that: no government spending on anything but debt service. No defense, no SS, no Medicare, no nothing. Our present course is literally unsustainable, since if we don't change course, people will eventually stop lending us money. Slarti is professing ignorance about one of the most powerful people in the modern Republican Party. What, you doubt me? You think I'm just making it up? I think I've made it fairly clear that although I've been (mostly) a Republican my entire adult life, the extent to which I'm hooked into the party goings-on is just a little to the plus side of nil. The tax burden has been shifted from the richest to the middle class over the last 20 years to the point that we virtually hava a flat tax system. You're going to have to show me. But if true, that would be a bad thing in what way, exactly? Equitable taxation is evil? And JFTR, I'm kind of neutral on the whole estate tax deal. If tax law were somewhat simpler, I'd feel more comfortable taking a position on this. Finally, hilzoy noted that Super Grover had a hand in the Contract with America, which is something I didn't know. If he wrote the outline of the contract (as opposed to the legislation) I'd say those are worthy goals. Unfortunately the legislation supposedly written to fulfill the CwA didn't seem all that well-related to its objectives. I could draw a comparison to something I observe in this thread to another time in recent history, but Godwin's law prevents me from doing so. If this thread wasn't so stale I'd probably get flamed for what I just wrote.